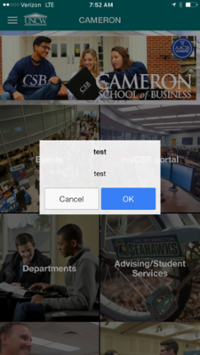 Cameron School of Business has its own app via AppyCity! When downloading, make sure you enable notifications. To adjust which channels you receive notifications for, choose 'notifications' from the app's hamburger menu. STRONGLY RECOMMENDED: CSB General and the department(s) of your concentration(s). Keep these channels on - there will be a monthly prize giveaways! When you receive the message on your 'lock screen', make sure you hold down or swipe the notification before you unlock instead of simply unlocking your phone in order to view the message in its entirety. 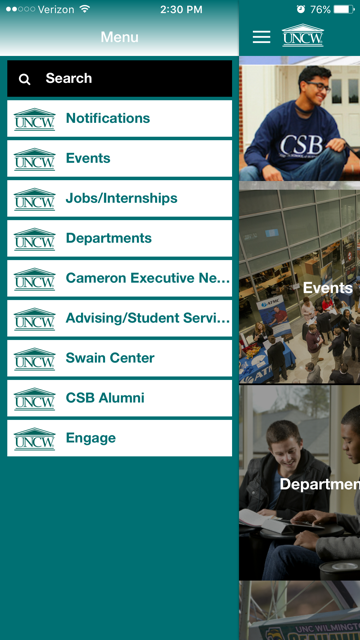 TIP: on iPhones, past notifications can be accessed by swiping down on the top of your screen! Clicking "Cancel" will close the notification; pushing "OK" will bring you to the event category/website/email directly related to that particular notification. Be the first to reply to the form and win a prize! Only CSB students are eligible as contest winners. Student may only win on one channel per month and may only win once every two months. The first student to reply to the notification via the form is the winner. Winning student must pick up their prize by the end of that week (Friday at 2pm).